I'm back with the last post of the year. This has been a good year with a lot of great projects! 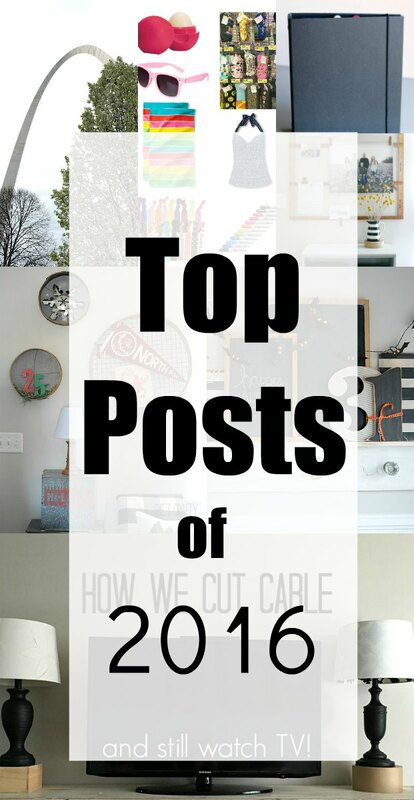 I'm recapping some of my favorite posts and projects from 2016! I started the year off with my DIY planner. I used this planner the entire year and it worked great!! Next year I'll be using something different. I'll be back with another post talking about my 2017 planner. In February I did some DIY Valentines. It's hard to believe it's time to start thinking about Valentine's Day! Minute 2 win it games. It was very successful and so much fun! In the Spring, I made DIY open shelves. I still have these up in my kitchen and LOVE them! I loved decorating them for Christmas! Easter baskets for teens and little boys. During Spring Break I took my kids on a trip to St. Louis. I would love to go back in 2017. One of my favorite places to visit is the Nashville Flea Market. I gave my top tips for shopping success. While at the flea market, I found some vintage yard sticks. So I made a photo and wall art holder with them. I made a savings jar to have a place to store my pennies! In the summer, we decided to cut cable. We are still able to watch TV. We have not missed it at all! I had so much fun decorating my mantel all year! One of my favorites was my Halloween Mantel. And finally I finished up the year with a Christmas Home Tour. It was such a great year of blogging! I have lots of projects planned for 2017 and can't wait to get started. Thank you all for reading! Big hugs to y'all!